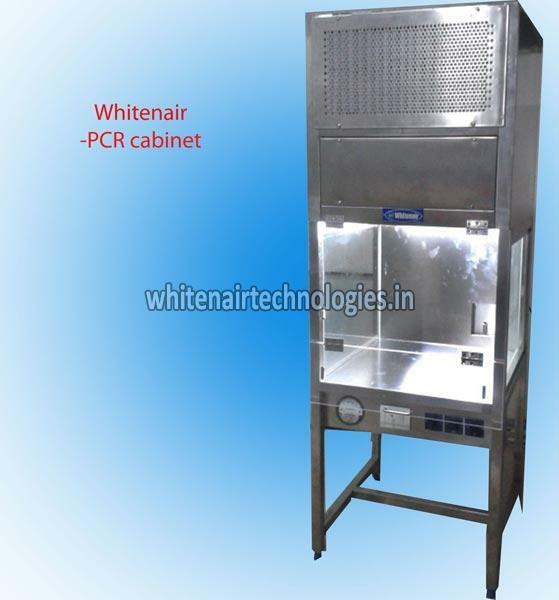 Whitenair PCR Cabinets are designed to simplify the contamination control and PCR process repeatability. Each whitenair PCR Cabinet provides ULPA/HEPA Filtered Vertical Laminar flow to purge the work zone of contaminants between amplifications and during preparatory procedures. An integrated UV lamp enables rapid decontamination of the Work zone between experiments and prevents cross contamination. Whitenair offers premium performance for a highly competitive price. Polymerase Chain reaction(PCR) is a process where millions of copies of DNA are amplified from a single copy, or low copy number template. This reaction is fundamental to almost all application requiring a high copy number of starting material and is used in all laboratories working with DNA and RNA. Because of the high copy number generated during PCR, it is essential to prevent possible contamination of the PCR reaction. Precaution must be taken during the sample and reagent preparation steps to minimize this risk . In addition to GLP, the ideal PCR laboratory should consist of three areas, each isolated from the other. Regents should be prepared in the regent preparation area and transferred to the sample preparation area through a pass box, or in a closed container. After preparation of the final reaction mix, the tubes should be transferred to the amplification area,again through a pass box or closed container. The PCR amplification and result analysis takes place this area. To guarantee contaminant free samples, it is essential to work in an environment where the air quality is controlled. This should from part of the equipment in the sample preparation area. Perfect vertical Laminar air flow with a large HEPA filter coverage to entire work zone. High quality polyester pre filter and Main Filter. Micro processor control provide flexible and full configurability. UV decontamination cycle is fully programmable, A timer will turn off the UV lamp after the set period of time.